Home » My Blog » Vintage Other » Christmas Tree Oh Christmas Tree! I would have to say that my favorite part of Christmas is the decorating! And not just any kind of holiday decorating, but Christmas Tree decorating! Ever since I was a kid this was the one thing that I looked forward to. Sure, I can’t deny that the presents were a nice little bonus, but for me, Christmas was about the Tree. It was about the family trip to Boone (which we still take) to a Christmas Tree farm to find the perfect tree. It was about the chopping of the tree, the hot cider drunk to battle the cold and the excitement of the hayride up and down the mountains. It was the reward that at the end of our trip we would get home, place the tree in its appointed Christmas corner and wait in anticipation as the tree slowly settled its prickly limbs. The smell of pine permeated the entire house and even today when I smell pine, I think of Home, of Family and of heartfelt Christmas memories. I swear I would walk in out of the room where our tree was held just to get whiffs of the mountain pine. Vintage AND Handmade? You’ve stolen my heart you gorgeous Cranberry Christmas Ornament you! 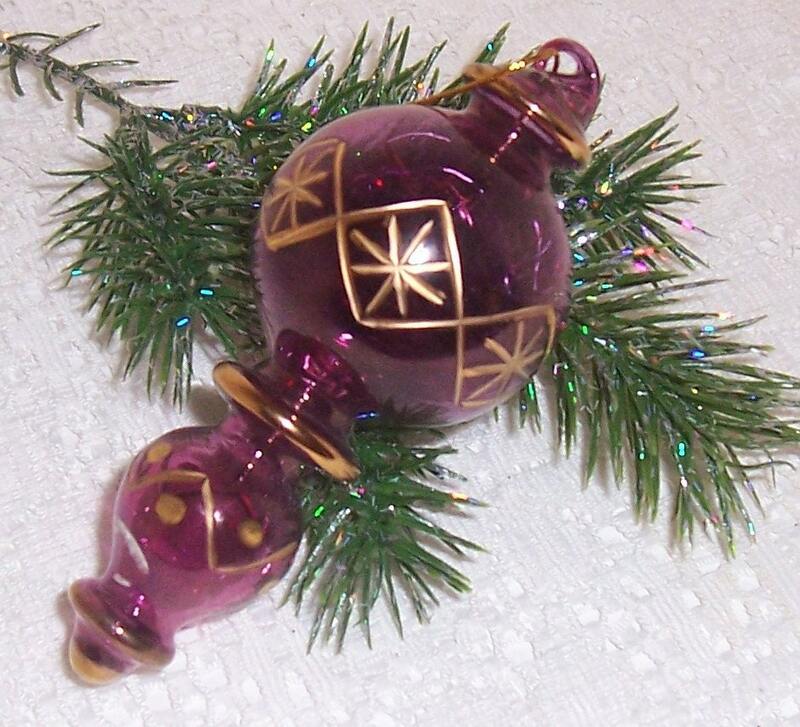 Hand blown to perfection, this vintage ornament from MsTookesMuzes is hand painted in 24 K Gold Leaf in traditional Christmas design. With no scratches or cracks, this fine piece of Christmas Cheer would make a delightful addition to your Xmas collection! I have to say that I love satin covered ornaments. Not only do they have a smooth shine to them, but I can’t break them! And if you knew me, you would know that one quality would be a major selling point for me! I’ve broken at least two ornaments every Christmas since I’ve had my own tree. I’m just super clumsy! But, this handmade lace ornament with snowflake design (which I adore!) from SnappyTatter would not be in danger of my slippery fingers! Check out the sellers site to find out what this limited edition ball is made of! You won’t believe the quality and care put into this little guy. You could even gift it if you wanted! So I know that when you usually think of ornaments you automatically think of the traditional Christmas ball. But, what about the other nontraditional ornaments? Like this vintage Lucite Snowman Ornament from OceanSideCastle. How could you not want this adorable snowman on your tree? He’s so jolly with his striped scarf and cocked hat! Makes me think of Frosty actually! Ornaments like these add such a unique feel to your Christmas Tree and are super fun to decorate with. Plus, they’re great conversation starters! Ummm..this is probably one of the coolest things that I’ve stumbled upon lately! 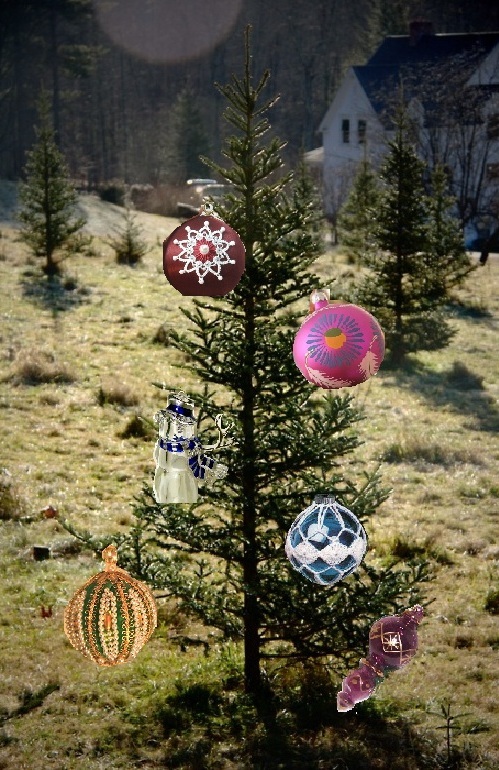 Vintage Crocheted Christmas Ornament Covers from Padurns. How did I not know about these goodies sooner? Take any old Christmas Ball, slip on the patterned cover and VALAH! you have a brand new ornament. Pretty neat huh? We have coozies and covers for all sorts of things, why not ornaments? Such a fun idea! Thanks 1980s! Satin AND Beads, oh my! Unbreakable and refreshingly original. You know I love it. These beautifully crafted Satin and Velvet Vintage Ornaments from MellowMermaid are in pristine condition. Beaded by hand these ornaments would look beautiful not only on your tree, but even on display on your dining table or hung around the house. They would actually be really pretty on a wreath interweaved with gold ribbon. I would defiantly be proud to hang that outside my house! What would you do with them? Couldn’t agree more with your post about the tree! We have started our family collection of ornaments that date back to our first tree where we handmade ornaments that are barely hanging on. I love that when we decorate almost each one has a story. Although, it takes longer and longer and (therefore more wine) to put up the tree because every ornament has a story that must be told each year, it truly brings out the meaning of the season…to celebrate the ones you love, the ones you lost and the time you have with those you have near by now matter how small, slight or quick those moments are. Because even though at the time that small 1.99 ornament might not mean anything now, in 5, 10, 15 and even 20 years down the road that ornament can be priceless. Wish you a very happy, merry and wonderful Christmas. You are right on with the decorating! I love it and being married for 16 years – my collection of christmas STUFF is getting large! What a creative and entertaining blog! I’m thrilled to have my snowman ornament featured here. A must follow! Off to share with my Vestiesteam mates. Thanks for your inspiring holiday article. Thanks so much for this post. I’m a Christmas ornament junkie, too. Each year I pull out the boxes of decorations, thinking I should trim the fat, but can’t seem to part with my old friends. This year I have 3 trees. One with my childhood ornaments from the 60’s & 70’s. One with handmade ornaments. And finally, the family tree jam packed with a little bit of everything! Merry Christmas! ← A Turkey Day Outfit Good Enough To Eat!